11" X 9" X 3 1/2"
that's a colorful shrine...with lots of beautiful details. I like your way of creativity, Jennifer. hello Jennifer. great work, as usual. Your imagination runs on rocket fuel. superb colours and design ... great work! 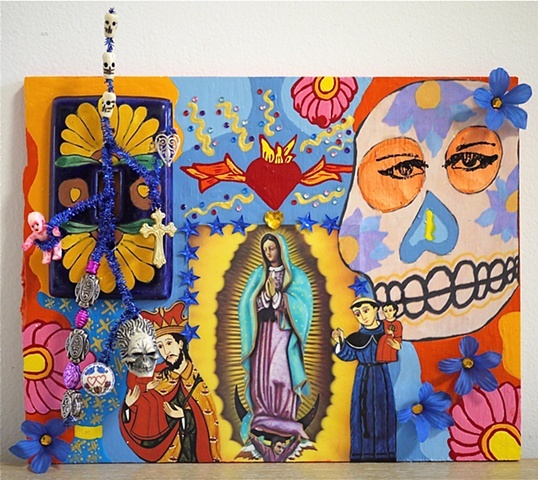 Great work with a profound influence from the mexican popular iconography..
Love and life emerging in triumph over death. What an eyeful! Wonderful variety of materials & vibrant colour! ..salute Jennifer!.....Great Art as always! Me gusta ver tus trabajos, querida amiga, que curiosos y extraños son....la imaginación ilimitada de jennifer!!! awesome work as always, Jennifer! your hands are from a Muse themselves :) wonderful! An ingenious project, a great work!!!!!! In questa composizione visiva si rileva un eccellente bilanciamento cromatico e una piacevole nitidezza che hanno offerto allocchio dellosservatore una ottimizzazione della visualizzazione generale con una eccellente risoluzione globale. Limmagine è coreografata da una miscela di colori con elementi sorprendentemente suggestivi, visto linsieme della creatività elaborata ed evidenziata. Inoltre si nota il ben curato il bilanciamento del bianco con la bella restituzione dei toni. this shrine is so beguiling to me - it's the mixture of figures - Although it's also the colors too, but it's all the rest of your figures and art. Somehow I think you are able to reach in to and remember our collective past and experiences - and your shrines and art reflects that - it's a message that's important. The aura's or the energy or the vibrations of those items you collect and depict - are so strong. it's a rare gift. Great artwork.!!! I like your expressive style. The colors, vivid. Multiple aspects together. Very interesting too. of our imagination--I'm refreshed & recharged with the coming seconds of life, as this shrine beckons me onward! Thanks for sharing your visions,& have a great weekend, JMP. Excellent artwork Jennifer. So much to study and reflect on. I really do enjoy your art. Very pleasing to the eye. I don't recall seeing this work before..Wow! i do absolutely adore your art dear friend! each work, a treat for the eyes and mind. Fabulous art, Jennifer...I so love your creativity! One of my Favest faves from your work my friend! stunning and vibrant art. A lovely use of artifacts and different types of materials again, Jennifer! Fabulous rich solid colours too! Beautifully creative and such a wonderful artwork presentation! It does have a Mexican flare about it too! Phenomenal "saintly" work of art! A real masterpiece!